Self-tan with a difference, these ingenious drops herald a new, natural era of golden glow-giving. 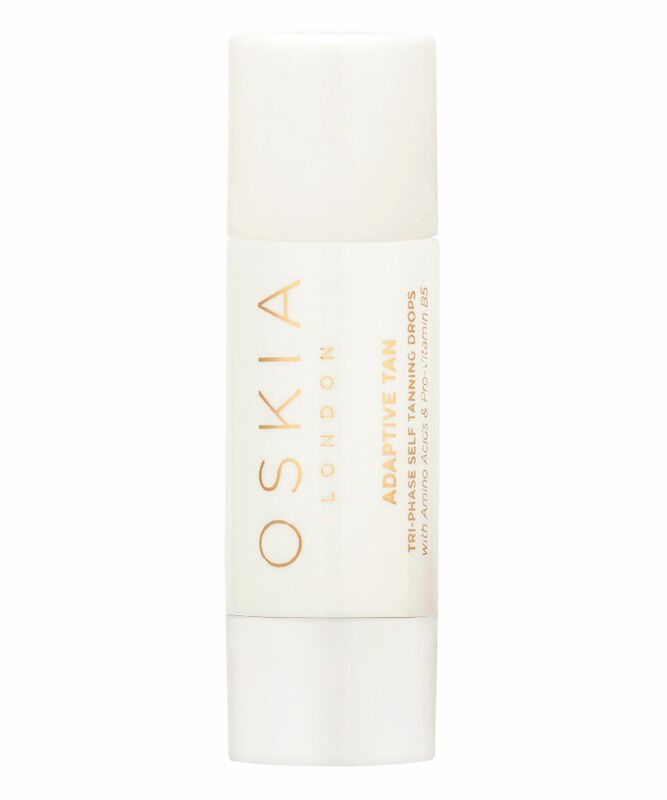 A 100% natural self-tan, the tri-phase formula features Oskia’s very own, naturally encapsulated DHA – the tanning agent – along with amino acids and natural melanin boosters to provide a natural-looking tan that gently deepens over time. Conditioning skin with health-boosting, antioxidant benefits (in-keeping with the brand’s bio-nutritional approach) the drops can be added to any moisturiser, serum, oil, or even foundation, leaving you with a beautiful, bespoke tan that develops within 3-4 hours and deepens over the following days. 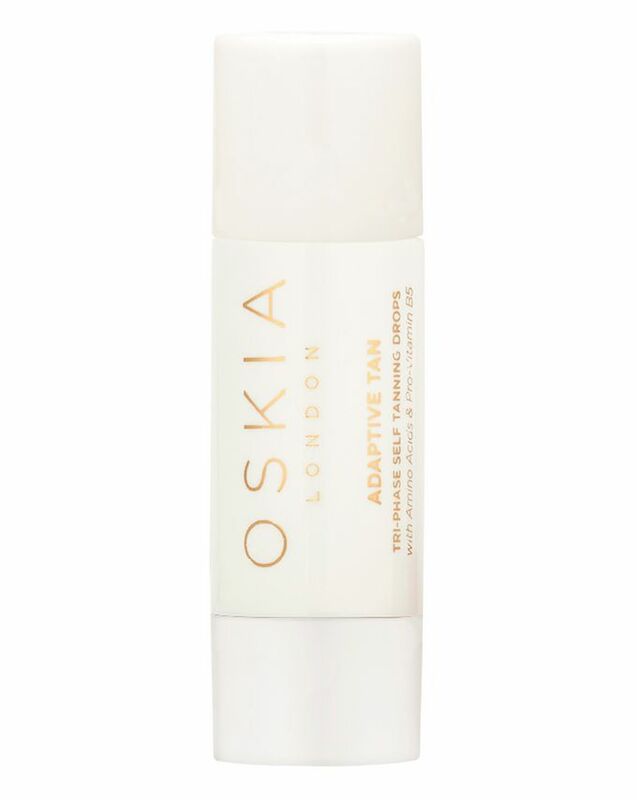 Ultra-luxe and characteristically innovative, Oskia’s Adaptive Tan Drops provide a new way to grant your skin a gorgeous golden glow: 100% natural self-tanning. Formulated by a crack team of doctors, nutritionists and cosmetic scientists, the drops contain Oskia’s own naturally encapsulated DHA (the tanning agent responsible for making you look like you’ve just returned from two weeks in the sun) along with amino acids and a natural melanin complex, which boost your natural colour. Providing a healthy glow within hours (3-4, to be precise) the colour gently deepens over time, while health-boosting, antioxidant benefits are granted from MSM, pea peptides, monk’s pepper, white tea and vitamins A, C, E and provitamin B5, nourishing skin beautifully while imparting flattering, sun-kissed colour. And the best part of all? These versatile drops can be slotted into your skin care routine wherever you see fit, creating a bespoke tan that you can control with the number of drops you add – they go especially well with moisturiser, serum, oil or even foundation. Who needs sunshine! Massage over entire face, neck and other areas as desired until absorbed, avoiding hairline and eyebrows. Thoroughly wash hands. Tan will start to develop within 3-4 hours and deepen over two days. Replace cap after use and screw on tightly. If product builds up on the nozzle tip, wipe away with a clean tissue. Keep product upright. Suitable for all skin types. Avoid contact with eyes. If this occurs, rinse immediately. Aqua (Water), Dihydroxyacetone, Glycerin, Erythrulose, Polysorbate 20, Vitex Agnus-Castus (Monks Pepper) Extract, Panthenol (Provitamin B5), Alcohol, Pisum Sativum (Pea) Peptide, Acetyl Tyrosine, Dimethyl Sulfone (MSM), Camelia Sinensis (White Tea) Leaf Extract, Arginine, Leuconostoc/ Radish Root Ferment Filtrate, Sodium Ascorbyl (Vitamin C) Phosphate, Tocopheryl (Vitamin E) Acetate, Glyceryl Linoleate, Glyceryl Linolenate, Retinyl (Vitamin A) Palmitate, Lecithin, Parfum (Natural Fragrance), Gluconolactone, Dehydroacetic Acid, Sodium Benzoate, Lactic Acid, Sorbitol, Xanthan Gum, Caprylyl Glycol, Benzyl Alchohol, Citric Acid, Potassium Sorbate, Disodium EDTA, Glyceryl Caprylate, Limonene**, Geraniol**, Linalool**, Citral**, Benzyl Benzoate**. Yes these are ridiculously expensive. But - they are truly the best tanning drops that I’ve used. I have tried Isle of Paradise and before that the Clarins drops, and I’ve always tried various facial tanning products. These drops are the ones that always produced, consistently, a natural looking subtle tan that is very believable. I use one drop every two days and the bottle has lasted me several months. I already bought a backup. Very highly recommended. I’m pretty fair, around NC15-20. If you want to give your skin that natural look and still look fresh, this is a perfect product for you. The price is quite high, but then you can rather invest in your skin care products and show your beautiful skin with this small “trick” to enhance it, instead of covering it with foundation. And It lasts very long as you need just a couple of drops. Love these tanning drops. It gives you such a naturally beautiful colour, not orangey at all. Prefer these than the TanLuxe ones. Totally recommend. First off, to be honest, I am an Oskia fangirl, there are several products I really love and I might be biased. BUT I really love this self-tanner. The drops are really easy to integrate into ones routine, just add them to your serum, they are easily spread and never look streaky. They look so natural and beautiful are really lightweight. They give you a realistic "healthy tan"-look. I have had no issues with irritation, and I have sensitive skin. The only thing I do not like that much is the packaging: You can't see when you are running out and the drops aren't really dropping out of the little bottle, I have to shake them out of their container, still this is a really minor issue for me since the drops always land where they are supposed to. Overall an awesome product! These drops add a gentle build-able even colour to my face with absolutely no smell. I add some drops to my night oil and use over my face and neck every few days. Doesn't dry out or cause any irritation as some tan for face can. I absolutely love them. 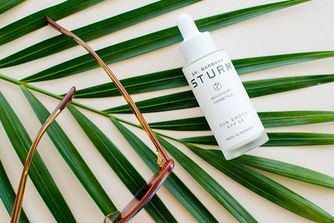 One drop in your serum and the tan you already have stays around longer. Two drops in your serum and you look like you had a nice weekend outdoors Three drops in your serum and you have a natural tan with a glow. Spreads evenly, a three drop application lasts 5 days. Nobody has asked me so far if my tan is fake, only where I was during my weekend. These are the best tanning drops I have tried. They are also the most expensive. Still these are the ones I am returning to as my bank account quietly weeps. I have neutral skin with a light warm undertone. Most of the self-tanning products in the market either made me too yellow or too orange. This is the only one I’ve tried so far that actually gives me a ‘natural’ tan. Will definitely repurchase.